This four bedroom traditional makes a grand impression with multiple front facing gables, elegant arched windows, and a barrel vaulted entry with stately columns. The foyer is enhanced by a graceful cathedral ceiling, fulfilling the promise of grandeur made by the home's exterior. Columns add definition to the casually elegant, open dining room, while the great room's spaciousness is augmented by another cathedral ceiling. The kitchen is more than generous, featuring a center work island, pantry, and breakfast counter, and the sunny breakfast bay is topped by a delightful, octagonal tray ceiling. 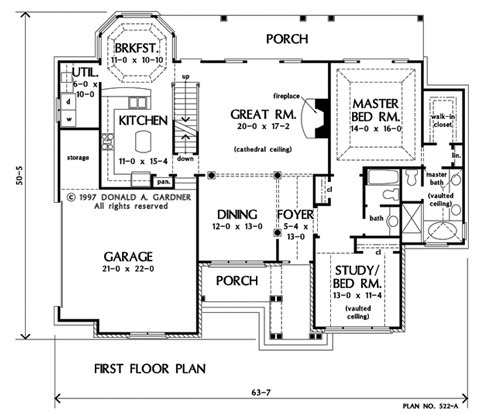 Each of the home's four bedrooms enjoys a special ceiling treatment, as does the master bath. A lovely picture window with circletop accents the versatile study/bedroom, and both bedrooms upstairs boast walk-in closets. 2nd Floor: 479 Sq. Ft. 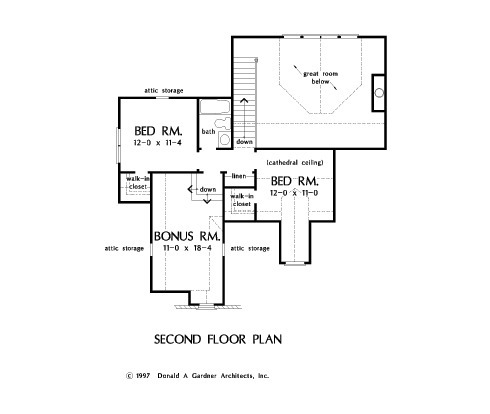 Bonus Room: 228 Sq. Ft.
House Dimensions: 63' 7" x 50' 5"
Great Room: 20' 0" x 17' 2"
Foyer (Cathedral): 5' 4" x 13' 0" x 10' 11"
Great Room (Cathedral): 20' 0" x 17' 2" x 20' 0"
Kitchen : 11' 0" x 15' 4" x 9' 0"
Breakfast Room (Tray): 11' 0" x 10' 10" x 10' 1"
Utility Room : 6' 0" x 10' 0" x 9' 0"
Bonus Room (Vaulted): 11' 0" x 18' 4" x 8' 0"
Garage Storage : 6' 0" x 9' 2" x 0' 0"
Master Bedroom (Tray): 14' 0" x 16' 0" x 11' 2"
Bedroom / Study (Vaulted): 13' 0" x 11' 4" x 11' 4"
Bedroom #2 (Cathedral): 12' 0" x 11' 0" x 12' 2"
Porch - Front : 16' 8" x 5' 6" x 0' 0"
Porch - Rear : 38' 4" x 7' 0" x 0' 0"